Black-eyed Susan vine (Thunbergia alata) is a frequent sight in hanging baskets at the garden center. This vine is as easy care as it is charming. The flowers have an almost pop art look to them, with a solid center surrounded by a ring of clear colored petals. The flowers look daisy-like at a distance, but they are actually tubular. Five overlapping petals surround a brownish-purple center tube, masquerading as a center disk. Look at the flower from the side and you'll see how the center funnels downward. The medium green leaves are a little coarse and grow opposite one another. They can be either heart-shaped or a kind of lanced arrowhead shape. This plant climbs by twining up support structures rather than clinging with tendrils. These vines will tangle themselves around the nearest support or spill over edges. They are perfect for hanging containers, but flow just as easily over walls and raised beds. A lattice or link fence makes a good choice for coaxing and weaving your vine into a living wall, but these plants will clamber over just about anything, from the mailbox to an old tree stump. Black-eyed Susan vine repeats blooms from May through fall. No deadheading is required to keep them in bloom. With their quick growth habit and sprawling nature, Black-eyed Susan vines can overtake nearby plants and are often grown as solo performers. However, a nice option is to mix the Black-eyed Susan vines with another vine that will intertwine with them. Morning Glories are often used for this purpose, particularly the purple varieties, which make a nice color combo. Purple Hyacinth bean is another good choice. They look beautiful near shorter purple flowers, like salvia and veronica, too. On the flip side, you can play up their flair with hotter colors, like brilliant red zinnias or canna, for a more tropical look. You will get the most flowers and the healthiest plants if you plant your Black-eyed Susan vines in full sun. The exception is in hot, dry climates, where growing the plants in partial afternoon shade is recommended. Black-eyed Susan vine likes a fairly neutral soil pH, of around 6.5 and a soil rich in organic matter. When setting out plants, work several inches of compost into the soil, if it is not sufficiently rich to start with. Although the vines don't like sitting in wet soil, they also don't like being hot and dry. Aim to keep them moderately moist. Mulching around the base of the plants will keep the roots cool and moist, without fear of rotting. Black-eyed Susan vine is only reliably perennial in USDA Hardiness Zones 9 and 10. Thunbergia alata is usually grown as an annual, although it has been known to over-winter in temperate climates, during very mild winters. Since black-eyed Susan vines are perennial, you can pot up a plant and bring it indoors for the winter. You will probably want to cut it back to a more manageable size when you do. You can also take stem cuttings and make new seedlings. Black-eyed Susan vines grow quickly once the temperature warms up. Black-eyed Susan vines are quick growing and bloom repeatedly throughout the summer. That means they will get hungry and will need a light feeding every four to six weeks, with a complete fertilizer, to keep them growing strong. If you are purchasing plants, you may only find them labeled as "Orange" or "Yellow." There are more varieties offered from seed. "Angel Wings" has white flowers with a hint of fragrance. "African Sunset" has burgundy centers surrounded by red, ivory and darker shades of apricot and salmon. "Spanish Eyes" shows unusual pastel shades of peach and apricot. "Superstar Orange" has traditional orange petals and dark center. "Susie Mix" produces flowers in yellow, orange and white. Container grown plants are fairly easy to find, but black-eyed Susan vine is easy to grow from seed. Seeds may seem relatively expensive, but that's because the seed is difficult to collect. You can start seed indoors, about six to eight weeks before your last frost date, or direct seed outdoors after danger of frost. Soak the large, hard seeds in water for a day or two, before planting. Black-eyed Susan vine plants don't like having their roots disturbed and it helps if you start the seed in peat or paper pots. Plant the seeds about 1/4-inch deep and expect them to germinate within two to three weeks, depending on the temperature. 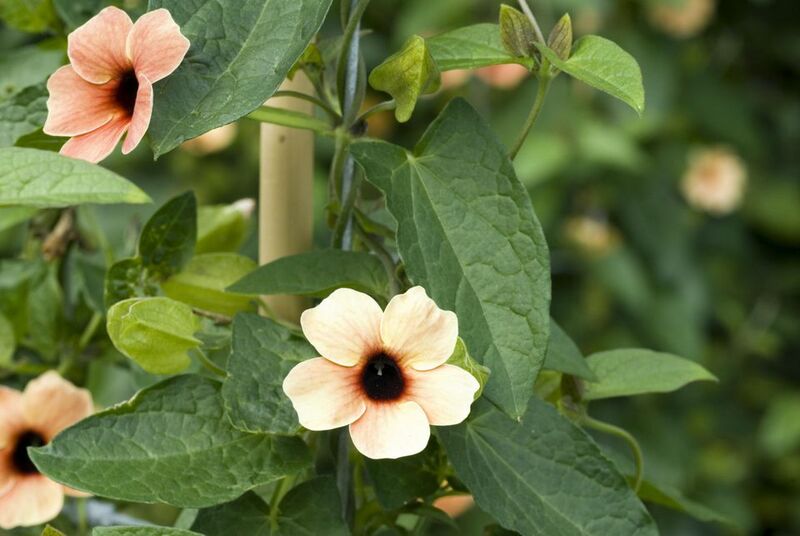 Black-eyed Susan vine is not prone to many problems, particularly if the vines are kept healthy and have plenty of sun, water, and air circulation. Whiteflies and spider mites can be potential problems, especially during hot weather and if brought indoors with dry heat. Keep a keen eye, to catch and treat any outbreaks quickly with insecticidal soap.